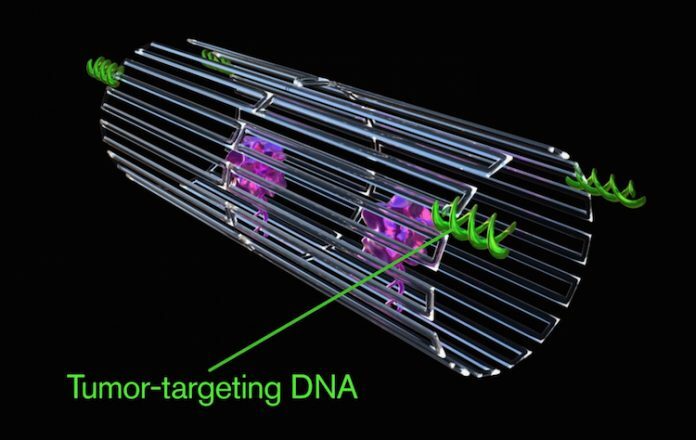 To achieve this, Hao Yan’s team turned to DNA origami as the foundation for developing a DNA nanorobot system, based on a self-assembled nanotube, which could deliver the coagulation protease thrombin specifically to tumors and essentially cause thrombosis in tumor-feeding blood vessels, but without affecting vasculature in healthy tissues. The project was started 5 years ago, when the NCNST researchers first looked at cutting off the tumor blood supply by inducing blood coagulation using DNA-based nanocarriers. Hao Yan's longstanding expertise in DNA origami expertise has allowed the nanomedicine concept to be upgraded to a fully programmable robotic system. “These nanorobots can be programmed to transport molecular payloads and cause on-site tumor blood supply blockages, which can lead to tissue death and shrink the tumor,” notes Ding. The team also carried out extensive safety studies in two different mammals, including the Bama miniature pig, which is physiologically and anatomically very similar to humans. “The nanorobot proved to be safe and immunologically inert for use in normal mice and also in Bama miniature pigs, showing no detectable changes in normal blood coagulation or cell morphology,” comments Yuliang Zhao. Importantly, there was no evidence that the nanorobots spread into the brain. “Treatment with [the] nanorobot-Th system did not lead to any significant variations in the blood coagulation parameters or histological morphology when compared to the control group, demonstrating that the nanorobot-Th is decidedly safe in the normal tissues of large animals,” the authors write.